Some news for (principally) our French speaking friends - there's a recently published Pink Floyd book which may be of interest to them. "How can Pink Floyd's music be precisely defined? How can its evolution be explained over time? The author offers an original reading grid to understand its mechanism and deep essence. 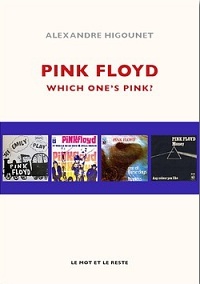 Built from a detailed analysis of each member's contributions, the book defines what makes the Floydian sound so emblematic, as well as it shows that far from being the result of chance, the various evolutions of Pink Floyd's music actually meet a specific logic, akin to musical tectonics where Rick Wright's place is far more central than the often mentioned Waters-Gilmour partnership." The book is written in French, and can be ordered from Amazon Canada, Amazon France, Amazon UK, Amazon.com, Amazon Germany, Amazon Spain and Amazon Italy or directly from the publishers.